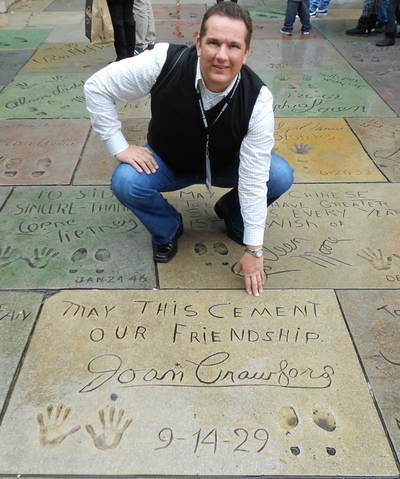 "May this cement our friendship"
Have you visited Joan sites such as her Brentwood home, NYC apartments, Ferncliff crypt, childhood homes, or other landmarks like her star or footprints outside Grauman's in Hollywood? 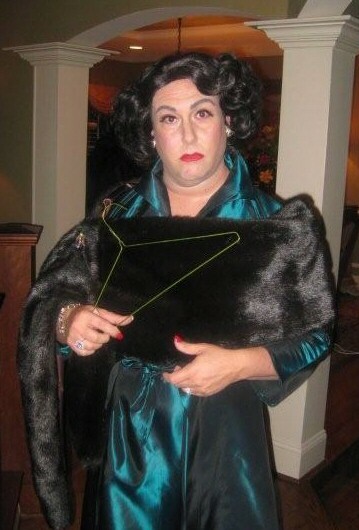 Have you ever dressed up as Joan for a party or attended a Joan-related event? If you've got pictures of yourself and/or friends at Joan locations or at Joan-related events and would like to see them on this page, please send 'em in! Above: A photo creation of Jason Paige Dumont, July 2014. Says Jason: "...I have been a 'Joanut' for years. I have just loved her since the first time I saw her in "Rain." ...I feel so close to her, like a dear old friend... She was so many things to so many people who loved her and never even met her. She has always been a great source of inspiration and strength for me." 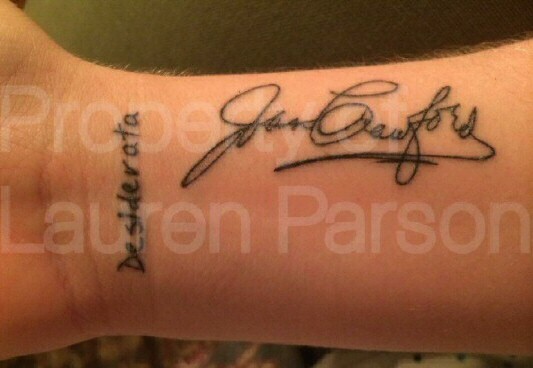 Above: December 2013: Lauren Parson of Texas with her brand new tattoos honoring Joan. 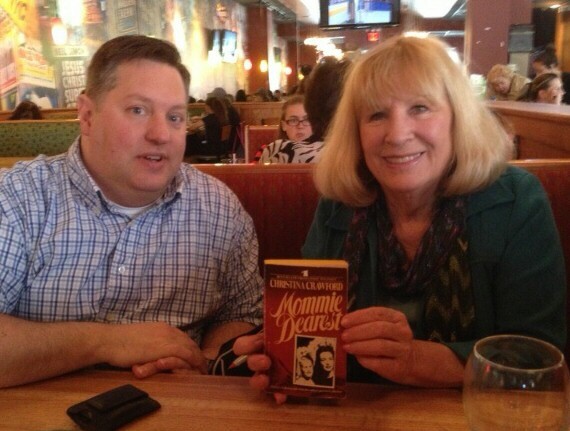 NYC press preview of Christina's one-woman show, "Surviving Mommie Dearest." 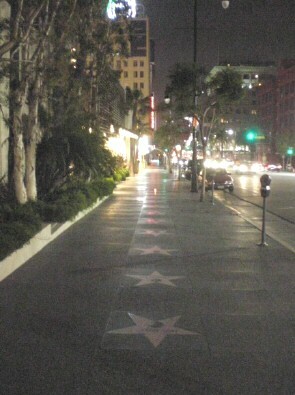 Above: Kevin Rollins in Hollywood, May 4, 2012: "In front of my goddess!" originally made circa 1946. 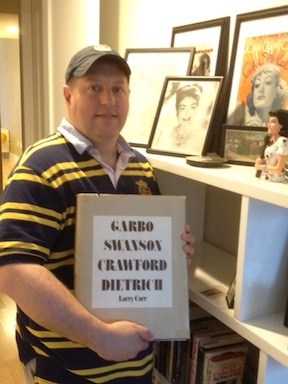 One copy was auctioned in 1989 for over $2000; Chris got a better bargain! 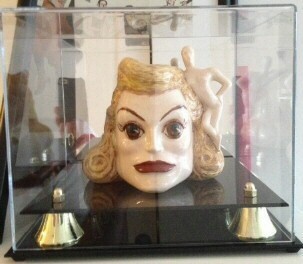 Above right: A second Joan mug acquired by Chris in 2013, as seen in his extensive Joan display case. 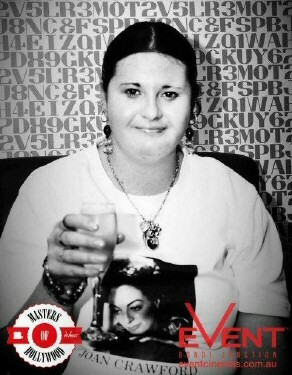 Relaxed by vodka, and also the sense of ultimate camaraderie she'd already encouraged, I said, "Are you kidding? Not at forty dollars a copy!" "Would you like my copy?" she smiled sweetly. "Oh Miss Crawford, I couldn't possibly..."
"Now don't be silly; I can always get another," she interrupted. And then called, "Mamacita! Bring me my black Pentel pen! Now, let's see...you spell it with a C, don't you?" 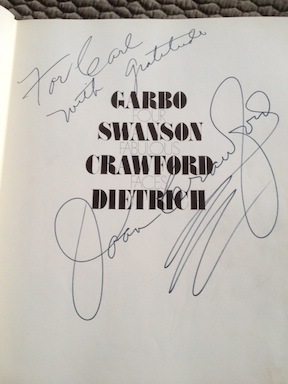 With a grand fluorish, she inscribed the book for me, covering her own name (and everybody else's as well) on the title page with the distinctive Crawford autograph. Then she looked at it and then up at me, and said, with a twinge of self-mockery, "I'm terribly sorry. I just don't know how to write small." I had been suitably rewarded for a job well done, and it didn't matter when I found out later that she had, of course, a whole closet full of Four Fabulous Faces. She had made me feel special, and that's what counted. It wasn't until well after her death that a mutual friend, while paging through that book in my living room, pointed out to me that Joan had carefully excised a candid photo of herself which first accompanied a New York Times interview. it's actually a marvelous picture of her, puffing away at a cigarette, her hair casually tousled, and an expression on her face that is at once both tough and tender. But it shows every wrinkle, and even a few freckles, and Crawford was still hell-bent on selling glamour, so she simply tore it out of each and every one of her own copies of Four Fabulous Faces. The image was everything. 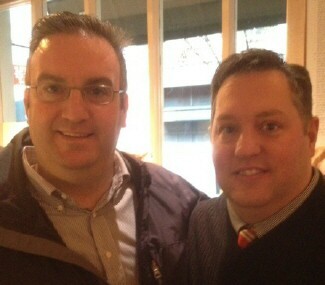 Above left: Chris Wilmore (right) at the Doyle NYC auction in December 2011, with Joan grandson Casey LaLonde. 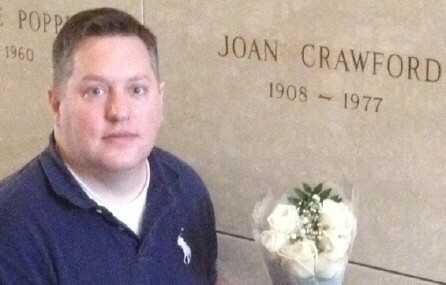 Above right: Chris at Joan's Ferncliff crypt, March 23, 2012. 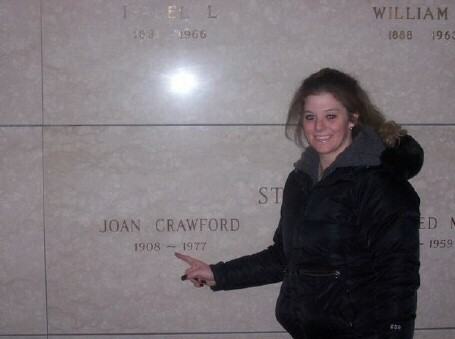 Above: LEFT: Crystal Pacey at Joan's Ferncliff crypt in 2011. RIGHT: Crystal at an August 2012 screening of Mildred Pierce at a Bondi theater in Australia. Above: Leah Hodder-Romano in 2011. "... 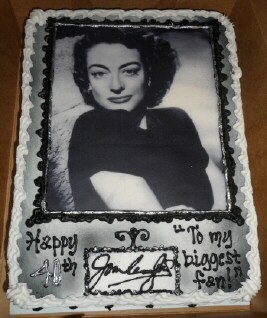 I became a huge Joan fan last year. 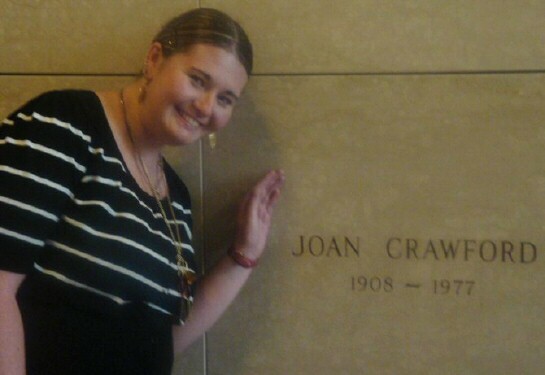 I was in LA this summer and visited as many Joan sites as possible. 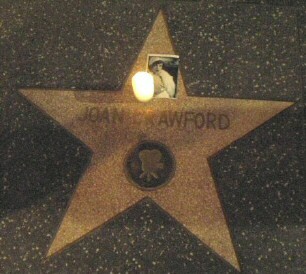 One of the pictures is at her star, taking in some fan-reading with Joan. Another is at her footprints -- our hands were the same exact size/shape! But her feet were expectedly way smaller than mine. 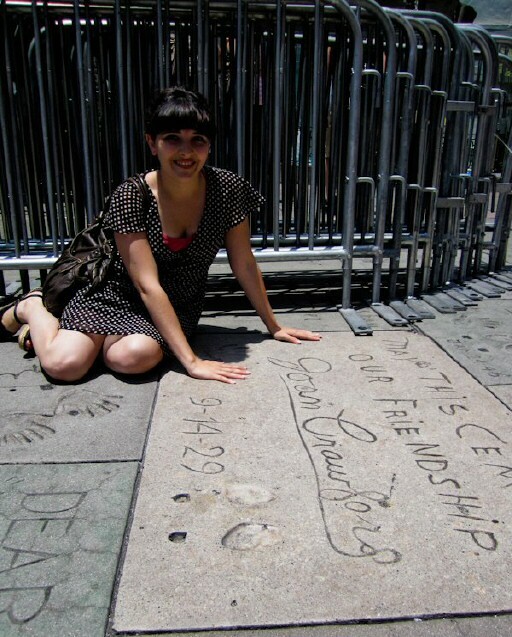 It was funny to think that she was only about 2 years older than me when she was making her imprints. The other [picture is] aboard the Queen Mary on the fourth of July. 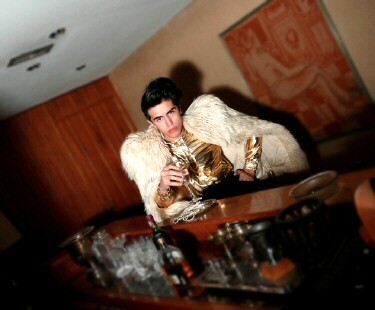 We were having fun with a Joan-on-Oscar-night photo shoot. 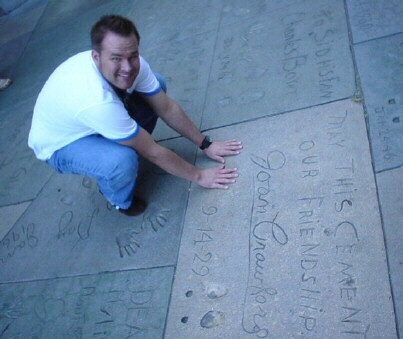 If I ever win an Oscar (or other award), you can count on me doing this for real in her honor!" 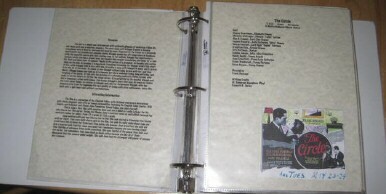 Above: Cover and sample pages from one of Steve Inman's two sets of Joan scrapbooks. Below: Steve's descriptions of his ongoing project. 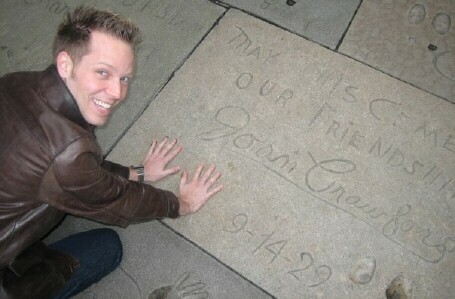 Followed by 2 photos from his October 2011 LA trip: at the "Baby Jane" house and at/on Joan's star. "Image 1 is of the cover of the book. I used a 3-ring binder to do it. One of my friends said I should buy 3-ring binders that are leather covered so I will do that later. Image 2 is of the first page. 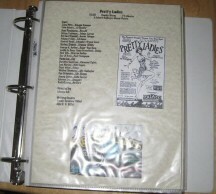 It is the introduction to Pretty Ladies. 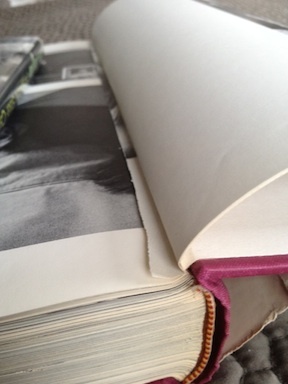 My idea for doing it this way comes from many different coffee table books and biographies. I took my favorite aspects and combined them. I typed up the title of the film, the next line is the date, genre, and minutes. the next line is the studio that filmed it and then I added cast, Director, Producer, and writing credits. After printing it on nice paper I took movie poster images from Google and printed them off and taped them on. 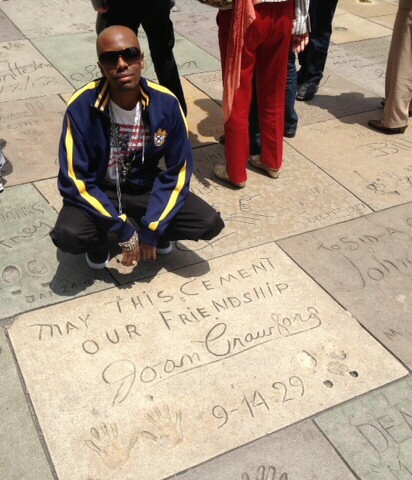 I have done this for every one of Joan's films. These are the introduction pages and all the memorabilia, photo stills, tobacco cards, etc will go after. Image 3 is of the back of Pretty Ladies. I wrote out a synopsis and then under that typed up all the fun interesting behind the scenes info i could find from biographies. 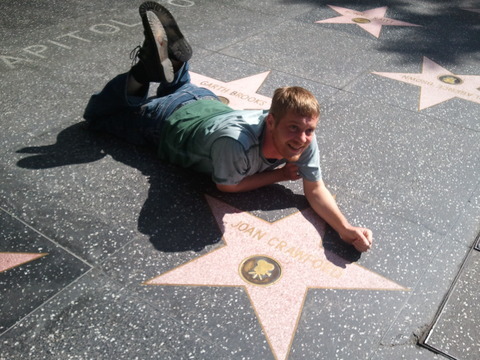 Again I have done this for every Joan Crawford film where she isn't an extra. You can also see the front side of the introduction to The Circle. 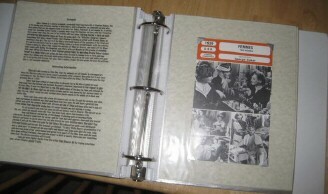 Image 4 is of the back of the introduction page of The Women and a French movie card. I took this picture to show a piece of Memorabilia in it. I had so much fun working on this and putting it together. 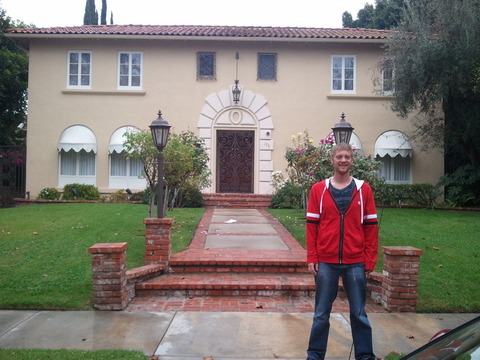 Because I'm going to Hollywood at the end of October  this project helped me save money by consuming my time. I can't wait to fill it up. 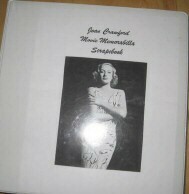 The binder is already full and I'm sure as I collect more memorabilia i will need several binders to hold everything." 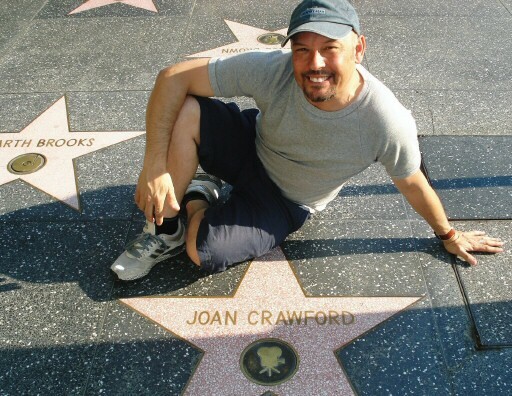 Above: Philip Hands from Australia at Joan's Hollywood star, 2011. Below is Philip's May 2011 review of the "Bette & Joan" play in London. 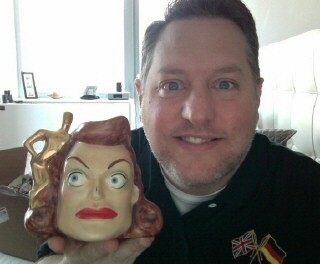 I recently attended the press night for �Bette and Joan� at the Arts Theatre in London�s West End on 10 May 2011. Tickets for that night�s performance seemed fitting, as it was the anniversary of Joan�s passing, and I was lucky to get seats in the second row from the stage. Greta Scacchi played Bette and Anita Dobson played Joan. The play was set in their dressing rooms � side by side. 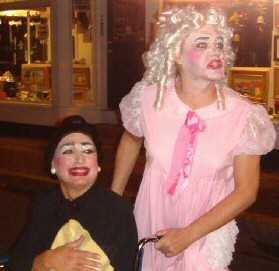 Bette�s was much plainer, with only the Baby Jane wig on display. Joan�s, however, contained a small Pepsi fridge and a couple of bouquets of flowers. Both had the director�s chair with their names on the back as per the original set and publicity photos. It was a very entertaining and engaging play. I enjoyed the production and thought both actresses did well in their parts. Being a diehard Joan fan I was familiar with most of the history and well-known quotes of both stars from the vast range of books published about them. As in Baby Jane, Greta Scacchi as Bette was larger than life and looked very much like her physically, not only in her appearance but with those Davis mannerisms and stance. 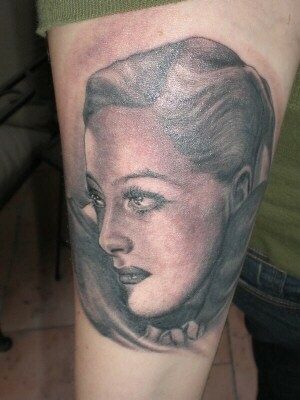 She had eerily become Bette Davis and hers was a strong performance. Anita�s characterization for me, however, did not reach the same depth, and this in no small part was due to the script, which made Joan little more than a cardboard cut-out. The writer, Anton Burge, was clearly fluent with the background of both his characters and used lots of well-known dialogue and quick-fire repartee from throughout their careers with abandon. Only true fans would know that much of the dialogue was out of context for 1962. However, this did not detract from the enjoyment of the performance. What I was most disappointed about, and felt flawed the production, was that the Joan character was set up to be inferior to that of Bette, and incorrect details about her life were stated as fact. For example, in the play she says that she always turned up to her director�s house naked underneath a house-coat; I have only been aware of this in the context of Torch Song -- a small point but paints the real Joan in a much less flattering light. For those unfamiliar with Joan, these inaccuracies from the outset tarnish playgoers' perception of her. I did not pick up on any similar issues with Bette�s character. It seems that after over 30 years people still prefer to see Joan as a caricature: how modern culture has perceived her to be rather than the woman herself. 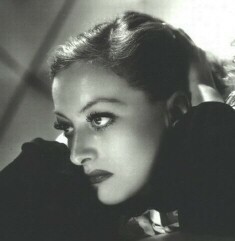 Very sad, I feel, given her contribution to the Golden Age of Hollywood. Such comments about her staying friends with all her husbands whom she �holds in her heart� and saying she was �a giver� are delivered with no warmth and little feeling. 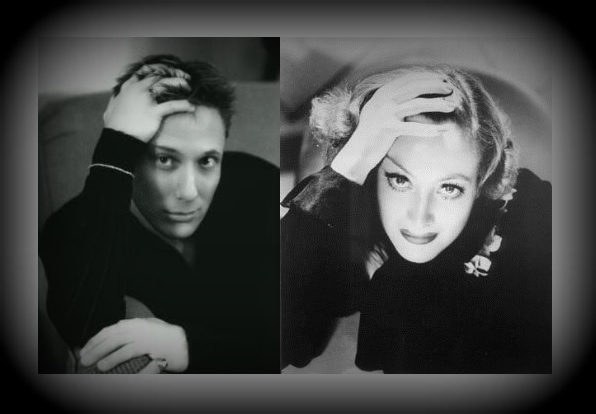 They came across false and unreal and did not befit the relationships: Franchot, for example, for whom she cooked in old age and scattered his ashes in the Canadian woods where they holidayed. While this could not be reflected in the play, the lines delivered misrepresented the actuality. 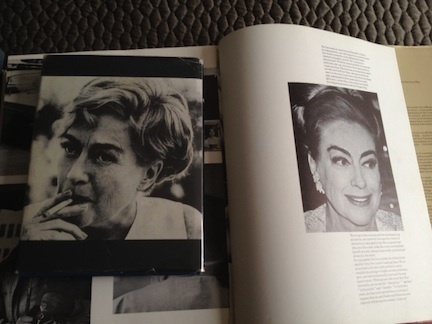 Perhaps I am being too critical � but at the outset I declared I was a Joan aficionado. I felt on the anniversary of her death that it was important that someone stood up for her. These comments aside, the play was still great fun to watch, and both actresses did a terrific job. I would highly recommend it to anyone who enjoys the work of either actress. As an aside, I was also disappointed there was no in memoriam after the show, given that 10 May 2011 marked 34 years since Joan�s passing. 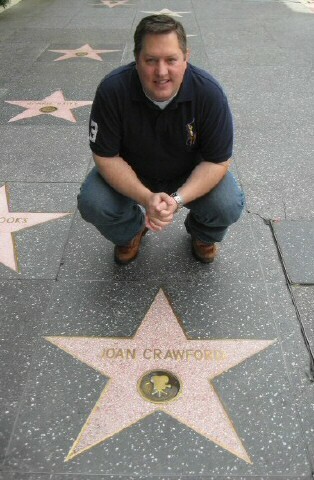 I did my best, in a crisp white French-cuffed shirt and Joan Crawford cufflinks. A toast was raised to our lady at the bar. As it turned out, I stood near Paul O�Grady (a London TV show host) and Cilla Black (a 1960s singer) at the bar. I was hoping to speak to them and maybe remind Cilla of an interview that appeared in a 1966 London newspaper comparing the responses to a series of questions of �a star from the 40s to that of a star of the 60s� while Joan was in London. At that time, Cilla Black had no idea who Joan was and said to the press something along the lines of �when they said Crawford was in town I thought they meant the biscuit people.� Alas, she caught my gaze and could see I wanted to speak to them; however, I received the most dismissive look I think I have ever received ("those damn fans! � as if!!"). As an Australian who happened to be in London, I would have appreciated the opportunity to meet them briefly as part of my London adventures. It might have been an interesting recollection for Cilla, long since forgotten, and I am sure Paul would have appreciated the cufflinks. Above: Happy birthday to Chris Wilmore! 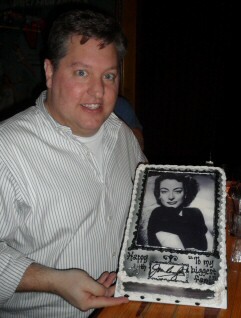 Chris's party was held at Lucky Strike Lanes in LA, with the gorgeous cake by "Cake and Art" of West Hollywood. 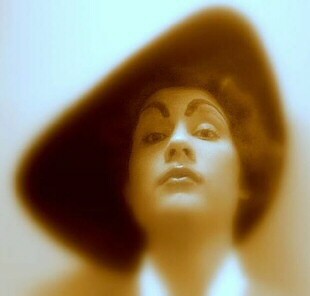 Above: Thanks to Andrew and Allison of LA for their above photo homage to Mildred Pierce. 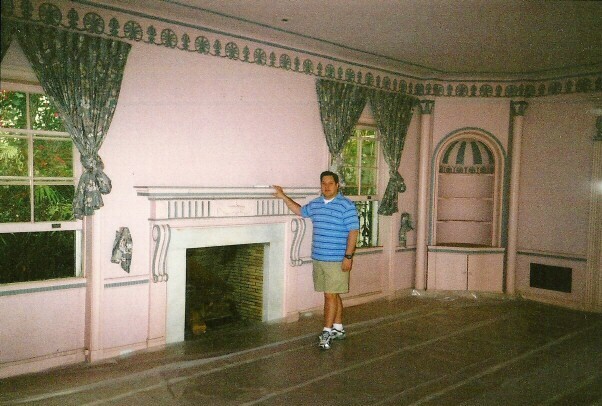 Says Andrew: "I am a set decorator and allison is a costume designer. 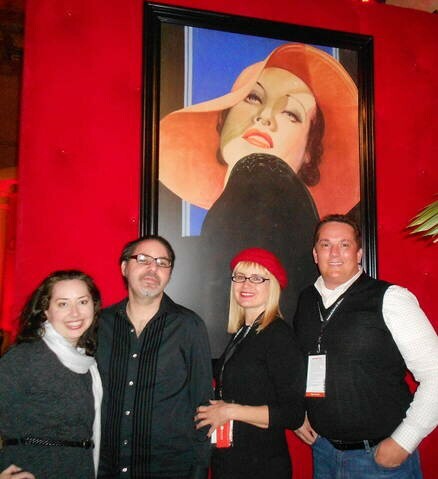 We love the 40's and esp. Joan. Just a fun project for us. Wanted to see how close we could get to period perfect detail on a shoestring budget. I did sets, furniture and props. Alli pulled clothes and did our hair and makeup. 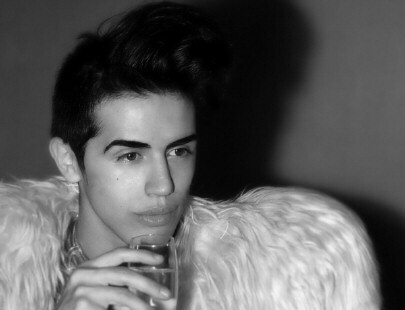 My friend marc did photography. Shot in an amazing 1920's spanish gothic apartment building in LA. 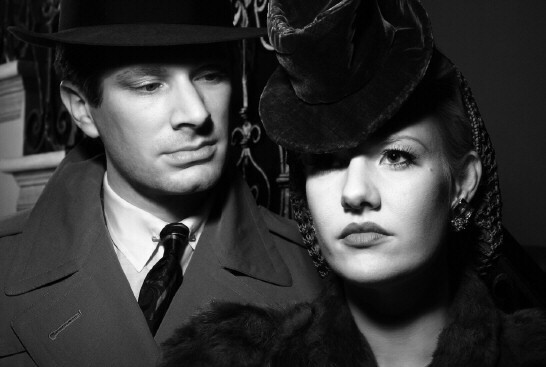 Looks pulled directly from mildred pierce. Esp. The interrogation scene." 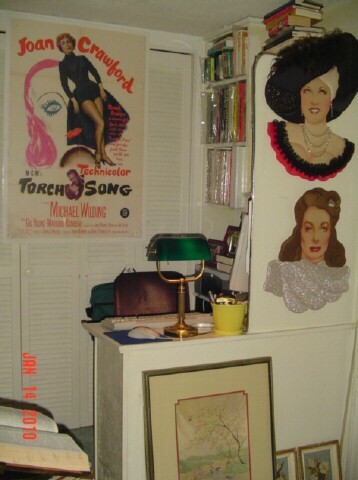 even the eyebrows and the diva attitude, very Possessed from 1947, very Mildred Pierce from 1945..."
ROW 3 -- Chris's space at home devoted to Joan, which includes a daily call sheet from Mildred Pierce, her funeral program, and a book from her library, among other treasures. 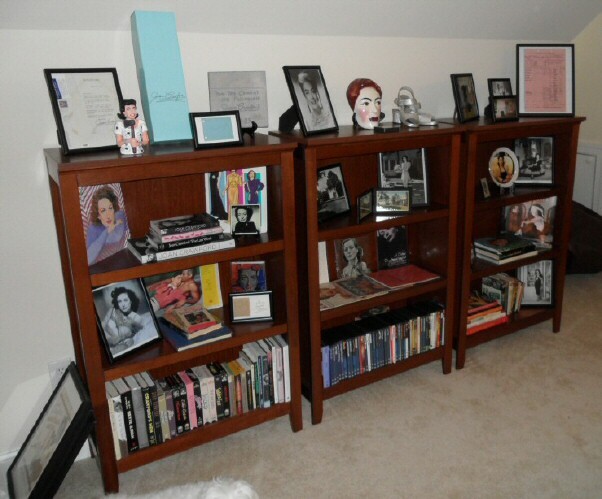 Above: Collector Charles Triplett's work area, featuring Joan. Charles also, from his personal collection, contributed a 2/18/76 Joan letter and a Joan poster to this site. 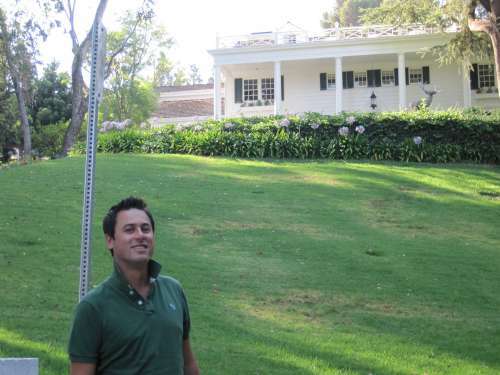 Above: Matthew from Australia at Joan's Brentwood home, 2009. 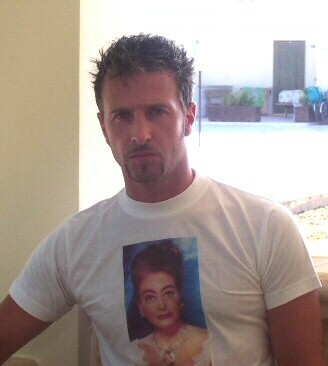 Above: Italian fan Lorenzo Botta today. 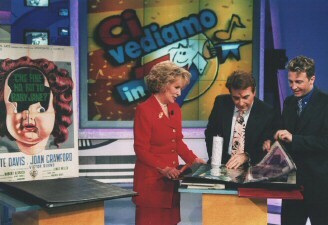 Below: Botta shows Christina his Joan scrapbook on the Italian program "Ci Vediamo in TV" (Feb. 18, 1999). See also the YouTube clip of Botta's appearance on the show. i lit a candle and placed a Sadie Thompson photo from Joan's role in "Rain"
said a prayer mentioning how we (her fans) miss her and admire her. 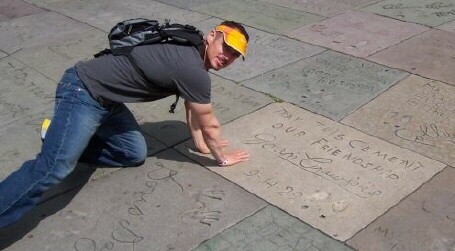 Above: Ex-pat Nathan Perry visiting Joan's LA landmarks at Grauman's in December 2008. Says Nathan: "Incidentally my hands were exactly the same size as Joan's prints (in fact my left ring finger was slightly shorter)!!!!!" 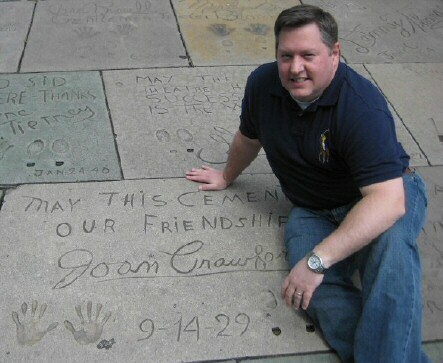 Above: James Rieker at Joan's Grauman's star in front of the Capitol Records building in LA. 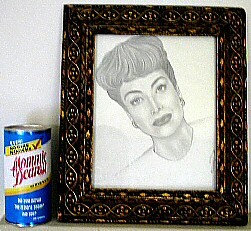 To the right is a portrait James drew of Joan (accompanied by a promo can of cleanser for the re-release of the Mommie DVD). 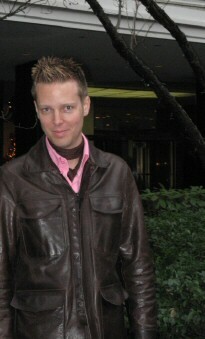 Above: Bart Montgomery, Halloween 2008. 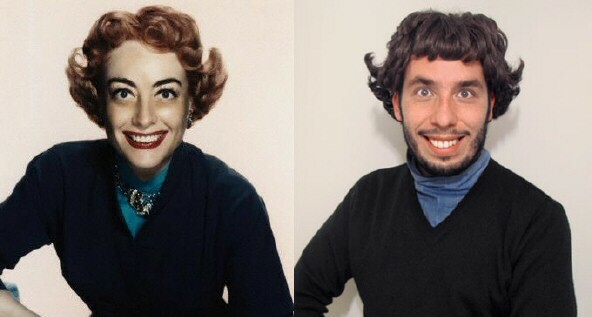 Bart writes: " I chose Joan�s hairstyle from 1946 and her wardrobe from 1949 and then threw in a little 'Mommie Dearest' to mix things up!" 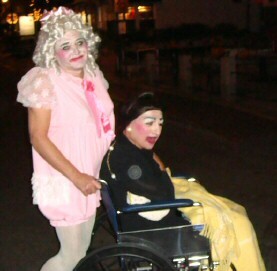 Above: Provincetown, Halloween 2008. Thanks to Tom of Newton, New Hampshire, for capturing these street shots. 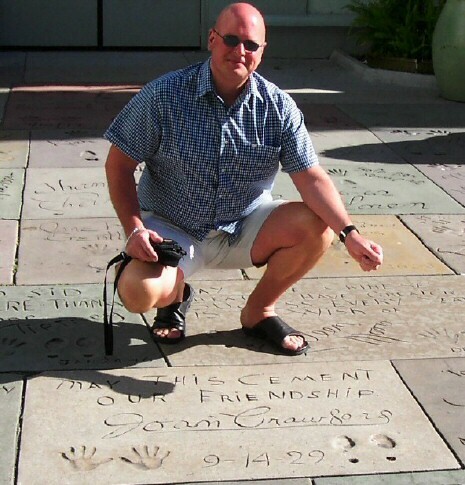 Above: Steve from Cincinnati, at Grauman's in 2005. Above: Gustavo from Argentina asks, "Can you spot the seven differences between these photos?" Above: Ronnie of Oakland, with friend Sarah. 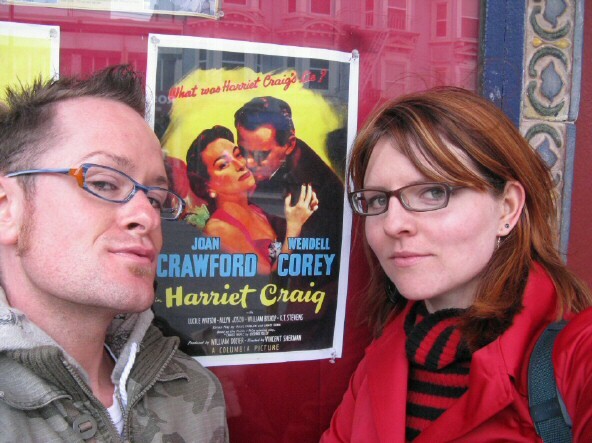 "We are outside of The Castro Theatre in San Francisco where we saw 'Harriet Craig'. 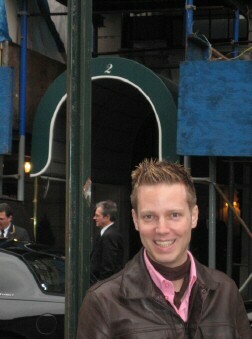 This was taken in April 2008. We really had a good time that day and we both enjoyed the movie very much. The audience was very enthusiastic. 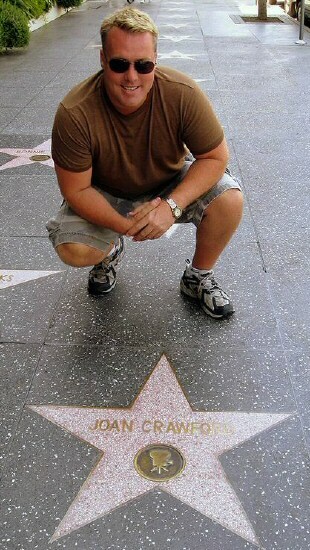 When Joan Crawford's name appeared on the screen, everyone applauded and cheered. At the end of the film there was another applause, and all throughout the film the audience was very enthusiastic." 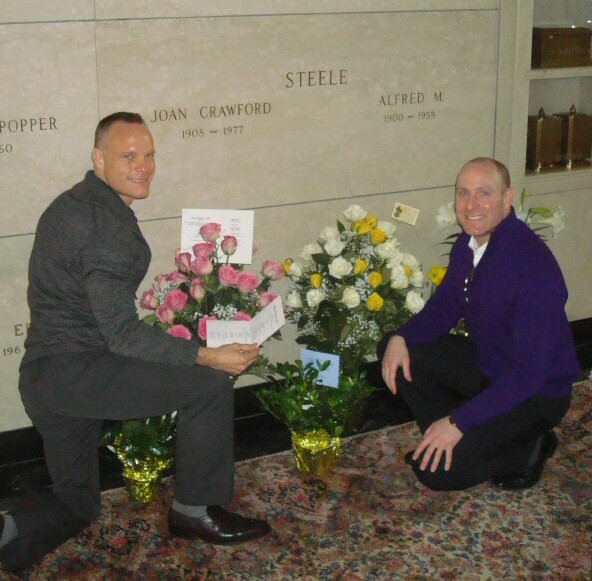 Above: Kevin and Doug bring gardenias to Joan's Ferncliff crypt on her official 100th birthday (March 23, 2008). Above: Jonathan of London poses in that city's Underground before a huge ad for the 2008 National Portrait Gallery's Vanity Fair exhibit. Above: Heather of Los Angeles just got this gorgeous tattoo done by Kat von D (of "Miami Ink" and "LA Ink" fame)! It's based on the 1933 Hurrell portrait of Joan shown at right. 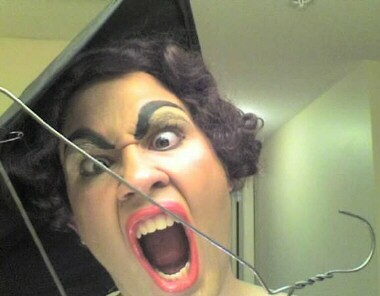 Above: Chris E. of British Columbia on Halloween '07, in both camp and glam Joan modes. 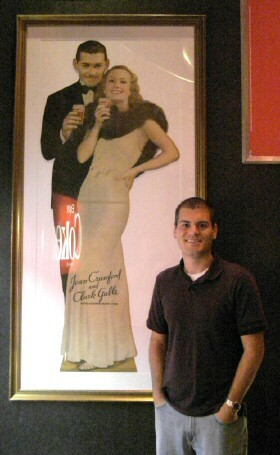 Above: Mark H. of South Carolina visiting Atlanta's "World of Coca-Cola" on July 14, 2007. ATLANTA, Georgia (AP) -- At the new World of Coca-Cola, Joan Crawford and Clark Gable greet visitors from a 74-year-old advertisement. A 3-D movie ride takes audiences on a journey to find the secret recipe of one of the world's most popular drinks. A nearby bottling line fills keepsake bottles before visitors' eyes. The "Collector's Corner" is one of the highlights of the new World of Coca-Cola in Atlanta, Georgia. 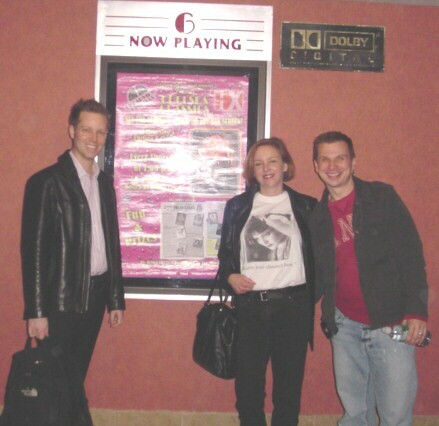 Above: Nathan, me, and Mike at the NYC Chelsea showing of "Harriet Craig," 4/19/07. Above: David, of Palm Springs, in Hollywood. 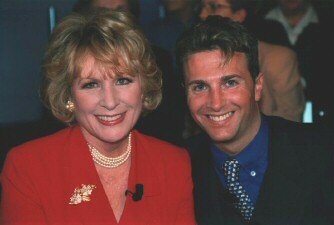 Above: Nathan (left) and friend at Joan's old corner of "21" in NYC. 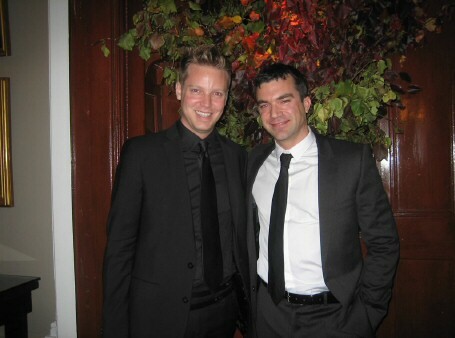 Below: Nathan, left, at Joan's East 70th St. apartment building in NYC. Right, at her Imperial House apartment building. Above: Jen from NYC at Joan's Ferncliff crypt, January '07. 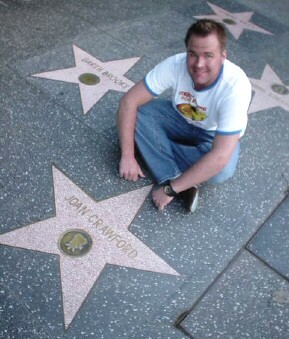 Above: Joel from Kansas City in Hollywood, December '06.